icture the scene, you’ve just got home after a hard day’s work at the office and are looking to unwind with your favorite whiskey. Think about when you have a delicious blend of Johnnie Walker Black Label that you love. It would be disappointing if all you have in your cupboards are normal, standard glasses. If you were drinking champagne in style, you’d be using a flute – so why not whiskey? You need proper whiskey glasses for men. Seriously, dude. Ya know, whiskey isn’t called the elixir of life for no reason! There’s more to choosing the right glass than just ensuring your Glenmorangie or Jack Daniels receives the star treatment it deserves. It actually plays a big part in the tasting side of things. The right glass can elevate the experience. While on the flip side, the wrong glass could expose your nose to too much of the harsh ethanol and even burn it. You want a drink to come to life in the right glass and the right whiskey glasses can do this. There’s far more of them than you ever imagined too. If you’re completely new to whiskey tasting or are only starting to take your passion seriously, we at Men’s Gear are here to help. We’ve researched and found the very best whiskey glasses for men available, all so that you don’t have to. Before we get started on looking at the awesome glasses we’ve thrown the spotlight on, it’s worth discussing the different types of glasses you can choose from. Each glass has its own purpose. It’s a good idea to look for the glass that provides the experience you’re looking for. The different types, volume, and weight are prime in importance. What are the Different Types of Whiskey Glasses? 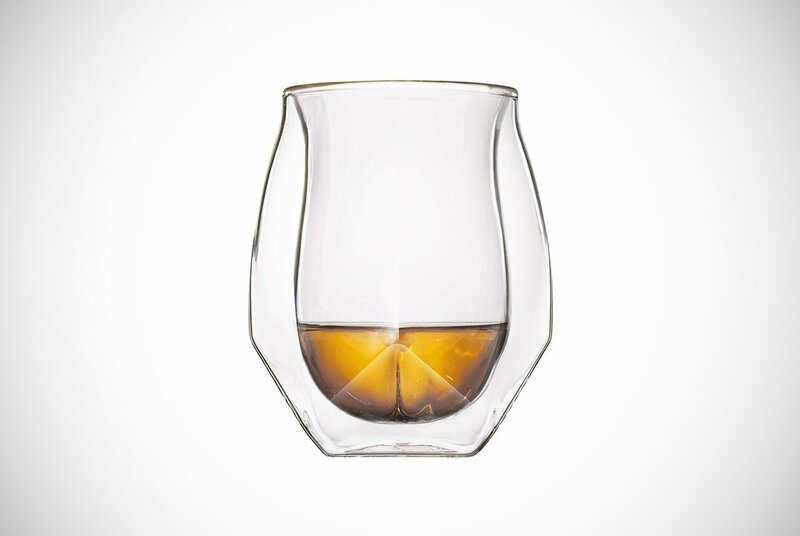 As hinted above, there are quite a few different whiskey glasses for men out there. For those that are new to the world of drinking, the variety can be daunting. 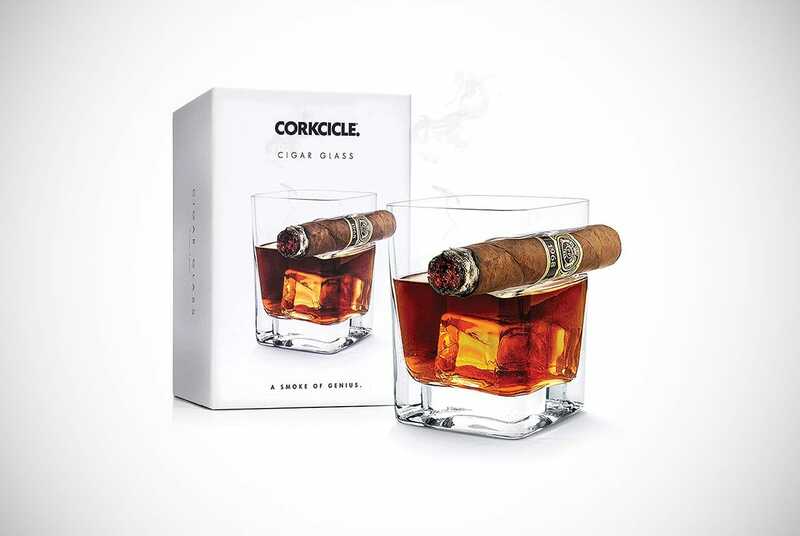 For those that are experienced in the game, you may still not be aware of some prime whiskey glasses for men out there. We cannot let either of you go through life the way you have when it comes to whiskey glasses. With that in mind, let’s take a look at the most common whiskey glasses today. 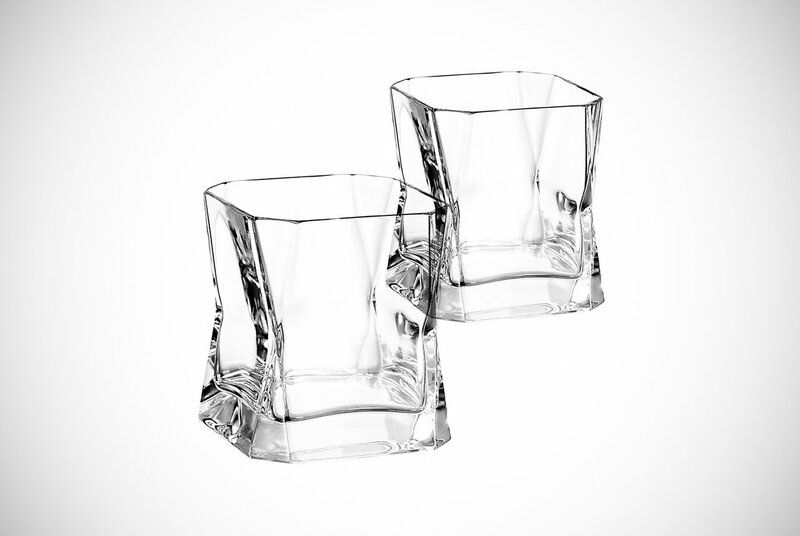 Tumblers are beloved and also referred to as the lowball, old-fashioned glass, or rocks glass. 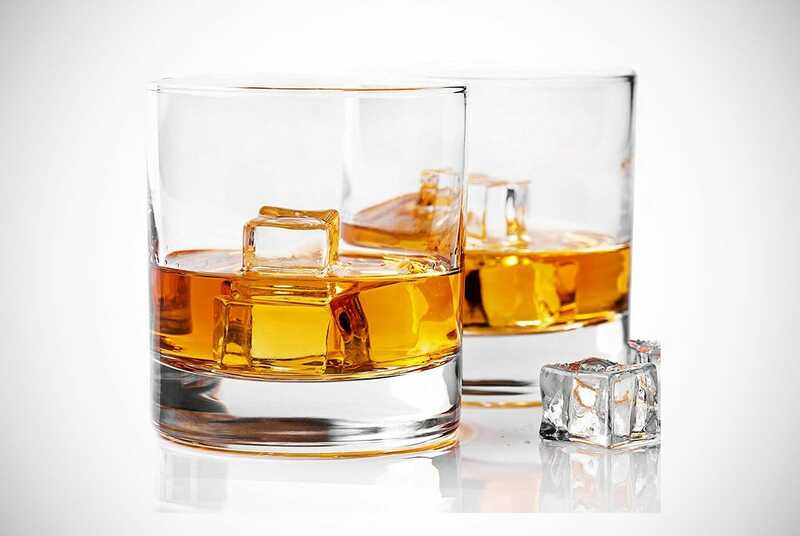 This is the most common type of whiskey glass. Therefore, the one that’s featured most heavily in our list. This is the kind that’s for sitting back and enjoying a whiskey or two with. 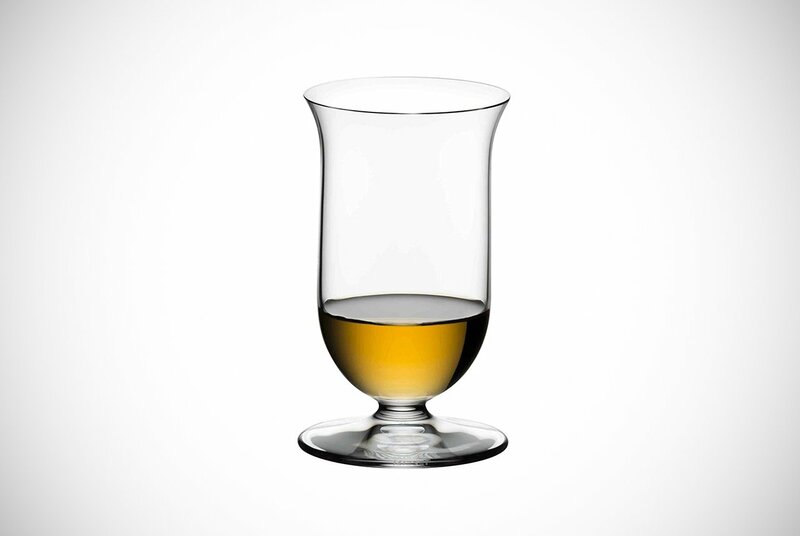 These whiskey glasses for men are known for their wide rim, so no good for nosing/tasting. Whether you prefer lots of ice or neat, the drink is allowed to shine. This is likely due to the common plainness of most Tumbler glasses. Following on nicely from the tumbler, we come to the highball. This is essentially a taller version of the tumbler. It also has the distinct honor of being associated with the simplest, but tastiest of all whiskey-centered cocktails. That, my friends, is the great Scotch and soda. Due to its size, there’s room for whiskey, ice, and your preferred mixer for longer drinks and cocktails. 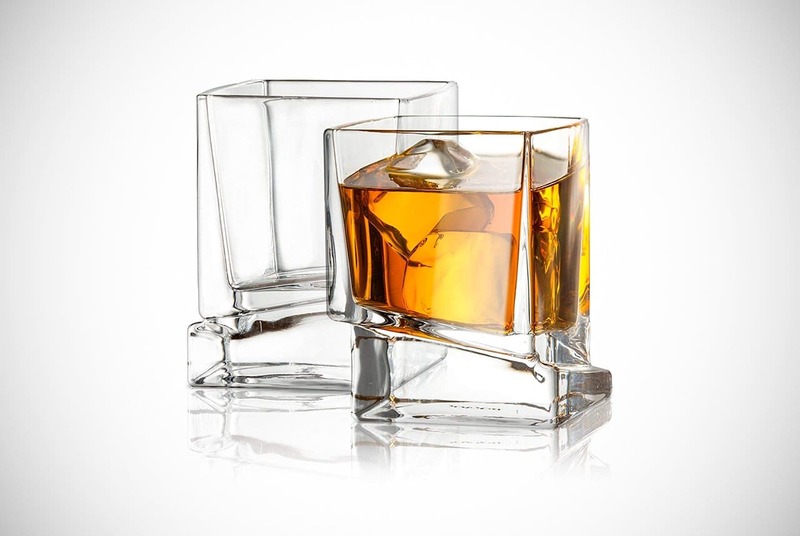 As you can tell, these whiskey glasses for men are often used for more than just whiskey. 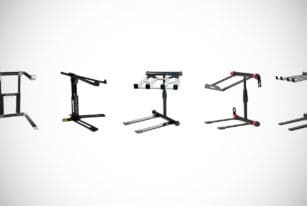 Their multi-function capability makes them a useful buy. This and the following tulip style are often considered to be one and the same thing. However, the tulip is regarded to be a sturdier vessel. Thanks to its size and thick glass, it’s perfect for beginners learning to swirl. This is something you need to know if you really want to open those aromas up to get the most out of your whiskey. As it has a narrower rim than the tumbler, for instance. The bowl-shaped base sends the aromas upwards while the body prevents ethanol from reaching your nose. While this may not seem like a big deal, the Glencairn glass is truly helping your taste buds. Since smell, basically your nose is responsible for a great deal of taste in a food or drink, the right glass is important. Keeping ethanol out of your nose, taste buds, allow that lovely whiskey to taste just right. This takes inspiration from the Spanish sherry glass known as “the copita.” It’s popular as the go-to glass for true whiskey connoisseurs, blenders, and master distillers across the globe. The long stem stops your hand from coming into contact with the nose. Similarly, to the above Glencairn, the bowl-shaped base sends the concentrated aromas through the rim. This is, of course, minus the harsh portion of the alcohol. If you’re looking to truly appreciate the fine details of single malt, this is the glass you need. This is relatively self-explanatory really. This is the one you opt for when you want to down quick bursts of whiskey with your buddies. It’s also useful for those who don’t intend for it to hang around in the glass for more than 10 seconds. It’s also the most popular thing a guy drinks from in movies to show off partying or depression drinking. Of course, shots are not just used for this. Often, they’re used just to have smaller levels of alcohol in your system. This is better than multiple big glasses filled with the stuff that’ll get you terribly drunk. To be fair, the movies use it because it looks better for a shot to see a person down alcohol quick. Yet the shot glass has an intention of just being good for the guy who just wants a drink or two and still can manage to drive home after. This is likely why shots are incredibly popular whiskey glasses for men these days. How Heavy are Whiskey Glasses Usually? Now that we’ve covered some of the different types of glasses, it’s time to address another important issue. That is the weight of glasses. As you’ll note from the selection of glasses we’ve highlighted, they all have different weights. While it’s fair to say that the difference in weight, numerically at least, is not massive. The proof is in the tasting, as the saying goes. Just as choosing the right type of glass is vital for getting the experience you want. The same can be said about finding the right weight. You don’t want to feel as if your glass is going to break the moment you place it down, that‘s for sure. On the other hand, if the glass you pick out is particularly heavy, it means there’s more glass and possibly a thicker design. Thicker doesn’t always mean better (your girlfriend may disagree). However, the thickness is particularly useless if you want to warm your elixir before sipping it. There may not be a world of difference between 5 and 8 ounces if you just want to drink some bourbon while you play poker. However, some might be looking to turn every mouthful into a spectacle where you swirl, then nose it before sipping a little at a time. If that is you, then you’ll need one that’ll help you achieve that. What is the Average Capacity of a Whiskey Glass? This is a very valid question, as there’s quite a variety of sizes and capacities out there. The amount of liquor a glass can hold is obviously important and should be appropriate for the type of drink you’re wanting to enjoy. Most draft beers are normally served in pint glasses or half pints. This is because it’s often how they are enjoyed by most. Cocktails tend to be served in bigger glasses than spirits served on the rocks or neat. This is mainly due to the need to carry the mixer, ice, and poison of choice. When it comes to whiskey, it again all depends on what you’re looking to get out of your experience. If you just want a bourbon and coke with a decent amount of ice, a small but wide tumbler, with a capacity of around 10-ounces, will suffice. Meanwhile, if you’re wanting to enjoy a full-on whiskey and soda with all the frills, you’ll want something that has double the capacity. For swirling, nosing, and tasting, the weight is not actually as big a deal as the shape. 10-ounces or even less than that is usually best. Shot glasses tend to be even less again. All this said and to address the question, the average is 10-ounces. However, you really need to choose the right capacity for the type of drinking experience you’re looking to enjoy. Now that we’ve answered those questions for you, it’s time to get down to business and look at some truly remarkable and exceedingly stylish whiskey glasses for men. First on our list is a truly sophisticated piece of masterful glass work. Ashcroft Fine Glasswares are behind this work of art that takes the humble whiskey tumbler and elevates it into something sublimely beautiful. The name twist is certainly perfect. Rather than it having a more uniform structure, it has a simple but effective twist to it. There’s a brilliant clarity to these whiskey glasses for men that makes every part of drinking from it, an experience. With a capacity of 10-ounces, the glasses in this set will hold enough of your favorite amber nectar to savor and enjoy it. Ashcroft wanted to design a glass to feel masculine in your hand, without being too much for your lady friend. It seems they did just that. 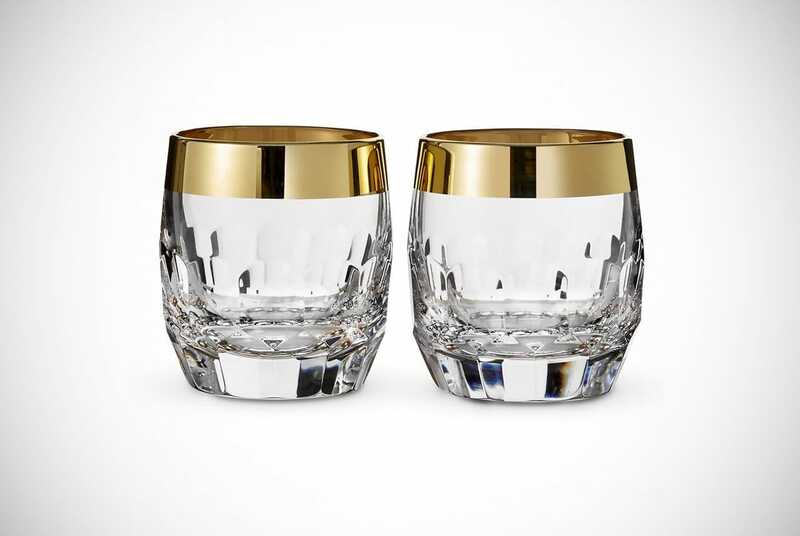 The glasses are something all whiskey aficionados should consider for their home bar. Sometimes, you need a real dragon to put fire in your belly. With these tilted old fashioned-style tumblers from Dragon Glassware, tasting your favorite blend or single malt will be a magical experience. Want to feel as if you’re sitting in a gentleman’s club with the rest of the upper echelons of society? Perhaps you prefer to think of yourself in a comfortable chair in a study surrounded by books, fine mahogany furniture, and a globe? 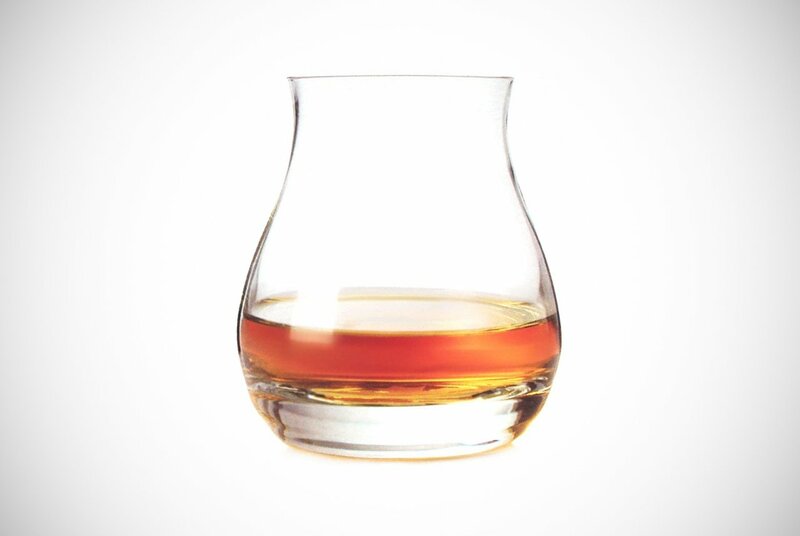 Either way, sniffing, sipping and tasting whiskey with this glass will transport you there. 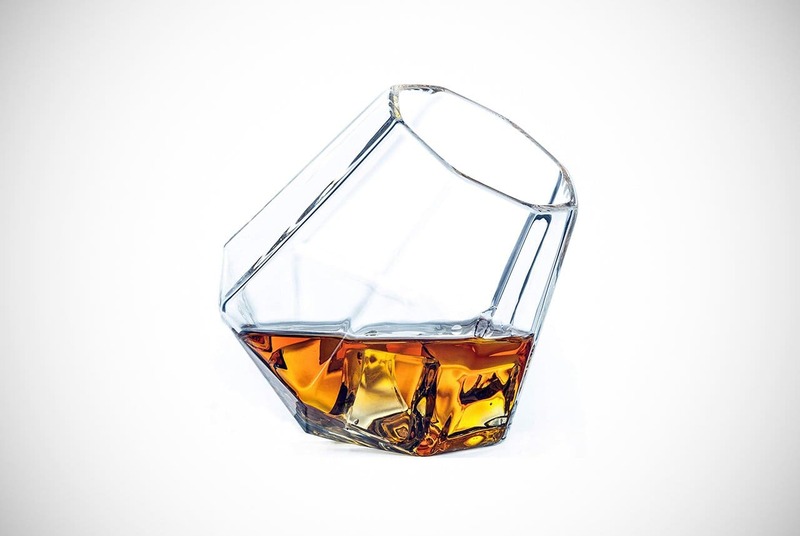 The curious but satisfyingly different shape of these whiskey glasses for men takes its inspiration from diamonds. However, it’s more than just a handsome thing to hold. The tilting allows your favorite nectar to aerate perfectly as you pour it and swirl it in the glass, musing on the world. That expensive bottle of Jameson’s or Glenfiddich deserves a beautiful vessel to deliver it to your mouth. You can do just that with this 10-ounce stylish tilted tumbler you may have that vessel. If you’re looking for a classy bourbon glass that really WOWs, look no further than the JoyJolt Carre square glasses. Just look at them, with their unique, almost architecture-inspired shape. 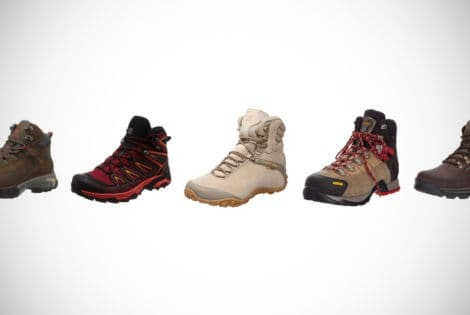 The sturdy base gives them a strong foundation. Meanwhile, the offset square of the main body provides a nice smooth ledge around one side of the base. This happens to be perfect for resting your thumb on. These whiskey glasses for men are handmade with the kind of expertise and care you’d expect from a famous artist. This glass is a marvel to behold when empty. However, it’s when it’s full of that wonderfully harsh liquor that it comes alive. Whether you’re a dark and sweet bourbon fan or prefer a peaty Speyside from Scotland, that’s up to you. Either way, this glass does what it was designed to do – lets your whiskey sing. There has been a lot of talk regarding unique design and style. That said, we thought we’d showcase a perfectly executed, traditional rocks whiskey glass. That’s exactly what we have with this excellent piece of glassware from Taylor’d Milestones. They are simple and elegant with very clean lines and crystal-clear appearance. Truly your 20-year old malt will look utterly captivating in these whiskey glasses for men. Aside from how liquor looks in the glass, the design ensures that your whiskey will stay at the right temperature for longer. This won’t win any design awards. However, it does deliver where it really counts. That’s in how comfortably it sits in your hand, and the clarity it offers to really let your whiskey steal the show. In terms of expert craftsmanship, it is clearly among the best you’ll ever find. We thought we’d push the boat out a little (sorry, not sorry) with our next item. More than just a single glass or even a set of two, this is a whole glass and decanter set. Set sail for a sea of delicious flavors with the nautical themed decanter set. This is a really fun glass set, while still being classy. Regarding the whiskey glasses for men in the set first, they are two bourbon tumblers. As you can see, it comes with a beautiful diamond cut pattern that’ll feel amazing in your hands. The star of the show really is the decanter. Made from glass crystal, it has a nice transparency to it, which helps show the glass ship on the inside off to perfection. As you use the easy pour tap-like spout, and more whiskey is consumed, more of that hand-blown glass work is revealed. It’ll make you want to get to the bottom. If you’re looking for something that F. Scott Fitzgerald and ole’ Jay Gatsby would be proud of, check this awesome old-fashioned glass out from Corkcicle. What makes this perfectly executed, if subtly magic square tumbler, stand out is the cigar rest built-in to its side. Hilariously, blatantly, but honestly, billed as a ‘two vice device,’ this is perfect for dabbling in both passions. These whiskey glasses for men give you that air of confidence like you’re a king, while also incredibly practical. We’ve not personally had experience of it, but we have it on good authority that trying to juggle a cigar and tumbler can make you look anything but a distinguished James Bond type. Heck, even he knew when to juggle stuff, stir, and shake! This crystal-clear glass and its handy little cigar ledge will make you want to dust off that suit and head to the nearest gentleman’s club. Just make sure you’ve got a membership or invite because the last thing you want to do is take the walk of shame back to your car. That said, Men’s Gear would like to point out that drinking and driving is a bad idea. Call a Taxi, Uber, or Lift. Heck, call your best bro or your dad. Your father’s disappointment in his drunk offspring won’t be too bad, considering he has a living one to be upset with. Trust us, he’d prefer it that way. The next potential vessel for your favorite liquor we want to tempt you with is this stunning creation from the masters at KANARS. This is a traditional rocks glass with a difference. The iceberg design around the bottom of the glass’ main body gives, what would otherwise be a dignified but plain glass, a dramatic look, and feel. It definitely feels very bold and masculine. It’s perfect for showcasing that deep and dark bourbon or almost apricot-orange hued single malt you love. 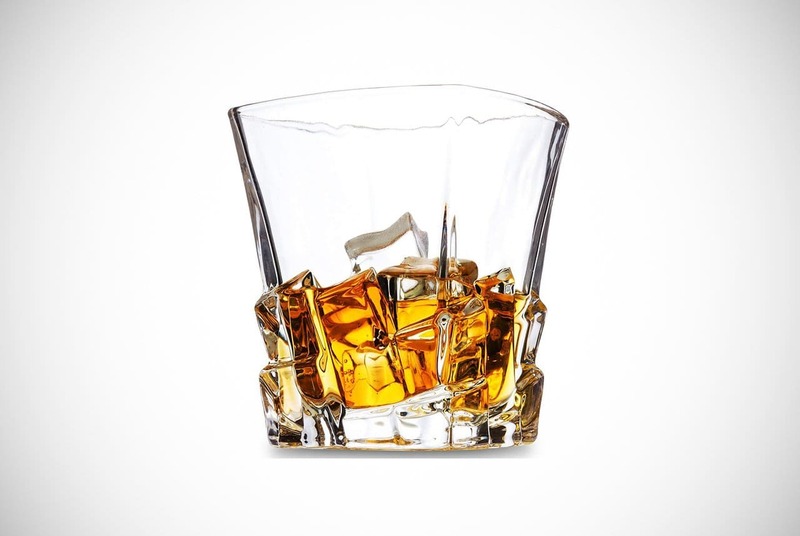 These whiskey glasses for men are perfect for a drink at home or out with your friends at a party. As with most on our list, this set of glasses is free from lead, so they’re not harmful. If you’re an understated, but quietly assertive type of guy, we think you’ll love this glass a lot. The iceberg styling not only gives it a nice finish but also plays a vital part in ensuring that your delicious nectar is kept colder for longer. This allows you to savor it, and that is never a bad thing. The rain is pouring, you’ve had a depressing day retiring those replicants. You’ve done a frankly poor attempt of seducing that delicious date you’ve landed yourself. What’s left to do but to take a sip of your fave tipple like Rick Deckard? Perhaps some of the tasty Johnnie Walker that was specially released for the Blade Runner: 2049. Although you probably know a lot about Blade Runner, did you know the glasses ol’ Deckard sipped whiskey from were not props? Seriously! Those whiskey glasses for men were actually exquisitely handblown by artisan glass crafters in Italy. This glass is the exact same type that Deckard sipped from. It’s by no means a replica (ha-ha) from Arnolfo di Cambio, based in Italy. This is more than just a great piece of movie memorabilia. It’s also a finely crafted vessel for that delicious elixir of life you’re looking to drown your sorrows in. We think it absolutely screams depressed and beaten down agent in a dystopian future, but that’s just us! 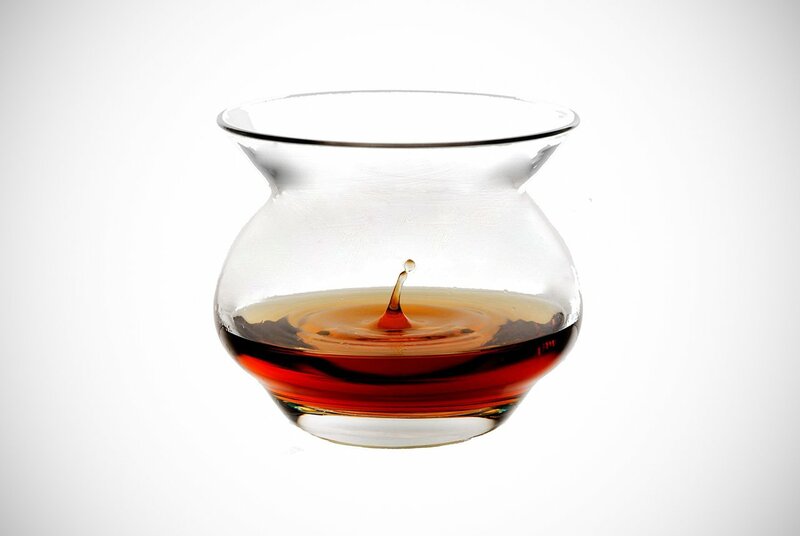 We felt it was our civic duty to all active whiskey connoisseurs and wannabe newbies to talk about this awesome looking creation from The NEAT Glass. First things first, we know it looks bizarre. It really does. However, its design is what makes it perfect for nosing and tasting. Especially that Glenmorangie 20-year old single malt of yours, or even Jameson’s and Balvenie Doublewood. Taste and aroma are key factors when it comes to quality. 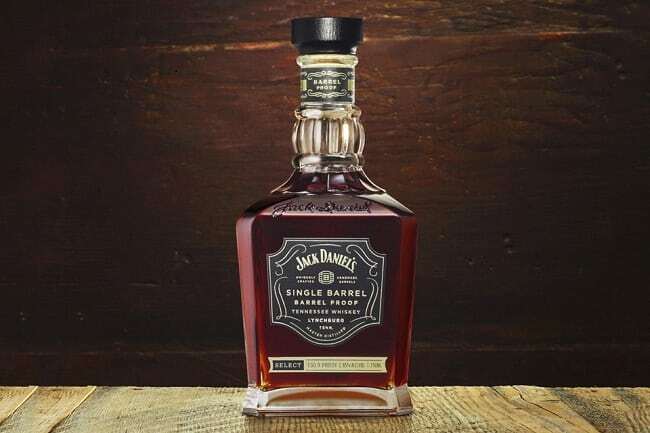 As alcohol burns your nose, it makes it harder for you to really appreciate the delicate balance of aromas crafted into a deliciously blended whiskey, Scotch, or even bourbon. 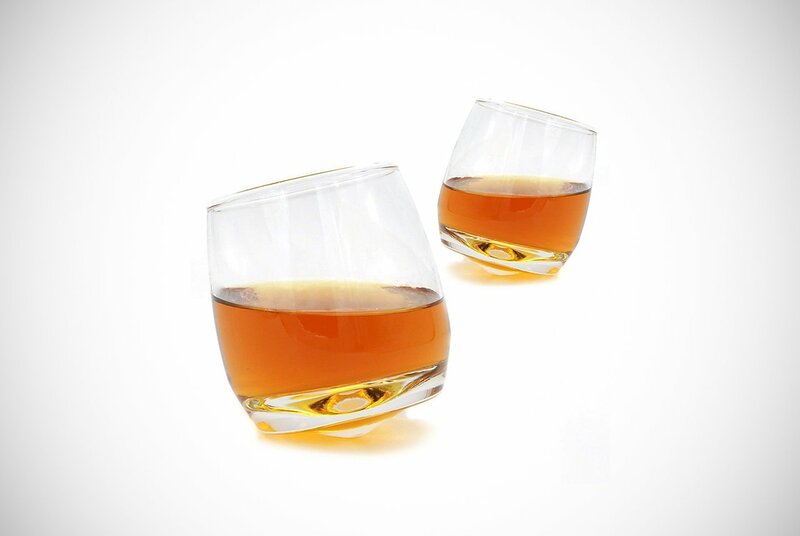 These whiskey glasses for men eliminate the problem and offer a great glass for you to use. How does the NEAT Experience glass help? The shape has been constructed to make swirling easier, sending the aromas upwards. Meanwhile, this reduces the burn from the alcohol. If you think you’ve tasted whiskey at its purest, we’d argue that you really haven’t until you’ve done so from the NEAT. Back to business as usual with the Sagaform rocking whiskey tumbler. This is another intelligently, yet subtly designed glass that sits nicely in your hand. That is thanks to the rounded bottom. If you love to cradle a glass of the amber-colored or dark brown-hued liquor, this might give you the drinking experience you desire. Rocking glasses often fill people with worries that they might fall over. Sagaform’s won’t and has been made precisely to avoid any spillages. Whiskey glasses for men made to help eliminate spilling or dropping is a huge favorite for most. You never want to lose that sweet nectar of life. Roger Persson helps with this wonderful glass. The aforementioned Roger Persson is the Swedish designer behind the glass and he is famed for his work involving curves and lines. Looking to stand out from the crowd and to be highly regarded for your discerning and sophisticated taste? Want your dinner parties and whiskey and gin soirée, shin-dig, or whatever the heck you call it, to be the talk of your social circle? 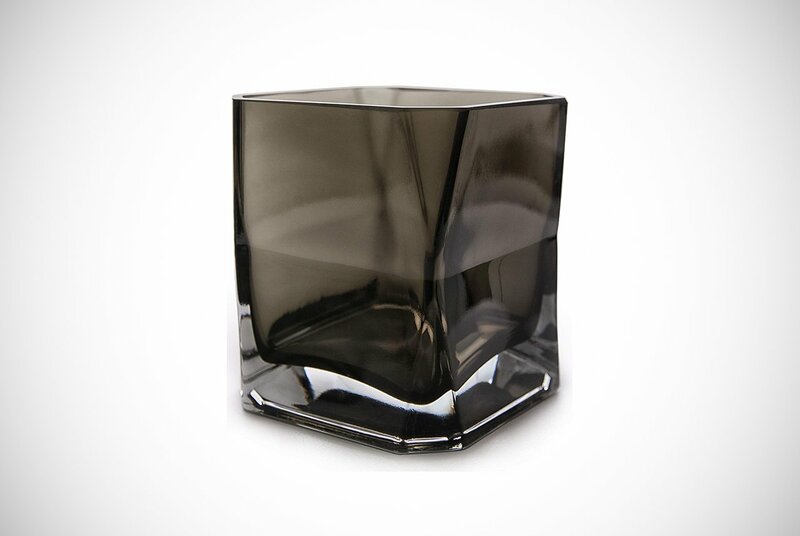 Men, you need this divine piece of glassware. Look, we know we’re most definitely going to catch some heat from readers for the inclusion of this particular tumbler. Yes, we know it’s not crystal or even glass. Come on though- it’s natural ox horn! Guys, if you’re not even slightly intrigued as to how it may feel to sip from this might glass, you’re not the same guys we fell in love with! Joking aside, you’re welcome to think what you like, but we think these whiskey glass for men are badass. It is a rule breaker, trendsetter, and enough to make the other guys at the mythical gentleman’s club in your head raise an eyebrow or two. It really is made from genuine and natural ox horn that has been chosen for the intricate variety of color and grain along with its amazing durability. Live life a little, imagine you’re Springfield Stonecutter or one of the odious residents of Westeros and sip whiskey like a legend! Not crystal or glass – elitists beware! No, we didn’t! Well, yes, we did, sir! We’ve done it again. Stoking the fires of controversy with these definitely stylish, yet eye-catching glasses. They are not clear or as transparent as you may be used to with whiskey glasses. That being said, picture yourself back in the 1960s. You’re about to take a sip from that Macallan that’s just been poured by the barkeep. In walks that hot lady, think Marilyn Monroe mixed with a bit of Rita Hayworth. Maybe Margot Robbie for you younger bros. Do you think she’ll give you a second glance if you’ve got an ordinary crystal-clear glass? We think not, sir. In fact, we’re certain! Harley Quinn fell in love with The Joker due to his crazy, rule-breaking style. She wants a real man! Phew, we got carried away there. Anyway, these whiskey glasses for men are perfect for you in nearly every situation. The truth is if you want to make a lasting impression when you have guests over or just want to drink your whiskey the way you damn please, this glass does both. Forgetting the divisive color for a moment, the actual design of the glass is spot on. It works to concentrate the flavor and aromas of the best whiskeys. We’re back in a more familiar territory with this encapsulating piece of glass work from Final Touch. You’ll notice from the image that there’s a rock actually in the glass. The base peak has been incorporated into the tumbler to encourage the liquor to move naturally. That increases the nosing of the whiskey’s aromas. We think the combination of the glass peak and the swirling of either your dark brown or yellowy-orange nectar will look spectacular together. 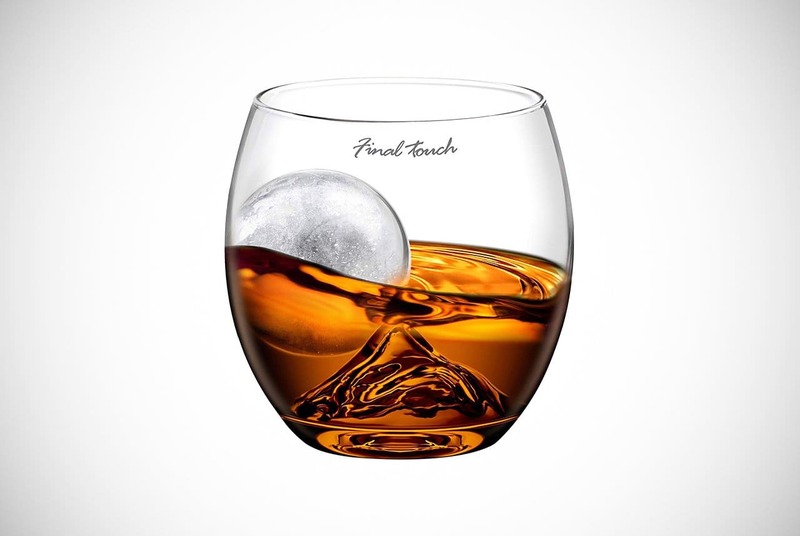 We’re certain these whiskey glasses for men will allow you to make a great impression with guests. In addition to the glass peak on the inside, there’s also a mold for an ice ball included. Simply fill that up to the marking and then stick it in your freezer. When it’s properly set you then have a long-lasting perfectly spherical ice ball. To cool your favorite tipple, you simply tilt the glass a little. Then just watch, listen, and experience the ball rolling around the glassy mountain. Compared to most of the whiskey glasses for men we’ve featured in this guide, this piece from Riedel is quite different. Namely, the base. It has a tulip or thistle shape as it comes up from the flat base. The fine crystal is showcased pleasantly with this design. It allows your imported Jura, Dalmore, Lagavulin, Balvenie or something completely different to take center stage. Riedel has really taken a considered approach to the crafting of this charming glass. The lip is ever-so-slightly and delicately out-turned. This is so that when you tip the glass against your lips, salivating with need, the heady liquid will roll directly onto the tip of your tongue. After the nose, the tongue is where a lot of the tasting process begins. It is where you’ll note the sweetness and creaminess of any drink, especially whiskey. Simple, yet effectively executed. If you’re looking for something a little different to the average tumbler, the Riedel Vinum could be perfect for you. If you don’t know who Jim McEwan is, and love Scotch, you should. He’s been involved in whiskey for over 50 years. McEwan famously worked at Bruichladdich Distillery as Master Distiller until 2015 when he moved onto Ardnahoe Distillery. Clearly, the man knows a thing or two about Islay and what he doesn’t know isn’t worth knowing! Why are we telling you this? The penultimate whiskey glasses for men in our guide are from Norlan, who perfected it over four days with the great man himself. We consider this to be the perfect marriage of modern design. Happening with an old and wise head that results in a truly remarkable piece of glassware. Just take a few moments to drink it in. The first notable thing is the double wall of glass, which makes it look like a piece of architecture rather than just a simple Scotch glass. The real ingenuity comes into play though with the inner protrusions that reduce the risk of ethanol nose burn. Along with the protrusions, the outside rim is a concave shape that has been created to fit comfortably onto your lower lip as you take a sip. Every step of the process of making this glass has been done with the end user in mind. Ashcroft Fine Glasswares are behind this work of art. 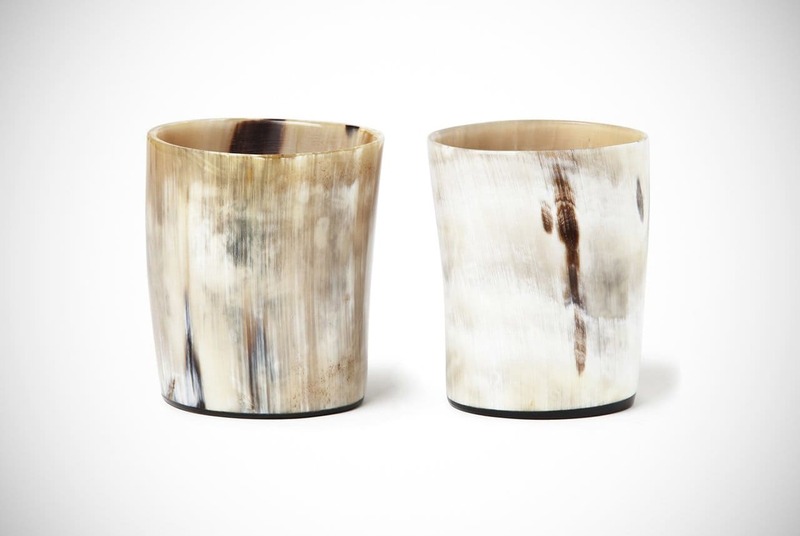 They take the humble whiskey tumbler and elevate it into something sublimely beautiful. The name twist is right for sure. Rather than it having a more uniform structure, it has a simple but effective twist to it. There’s a brilliant clarity to the glass that makes every part of drinking from it an experience. 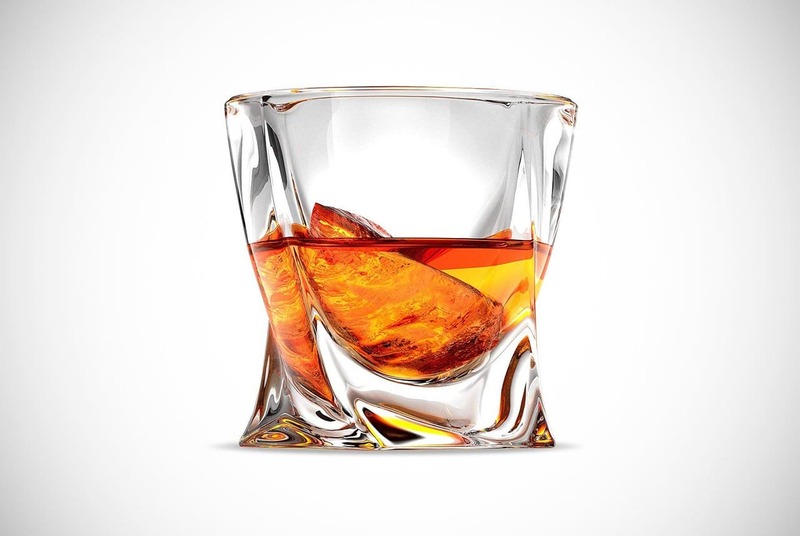 With a capacity of 10-ounces, these whiskey glasses for men will hold enough of your favorite amber nectar to savor and enjoy it. 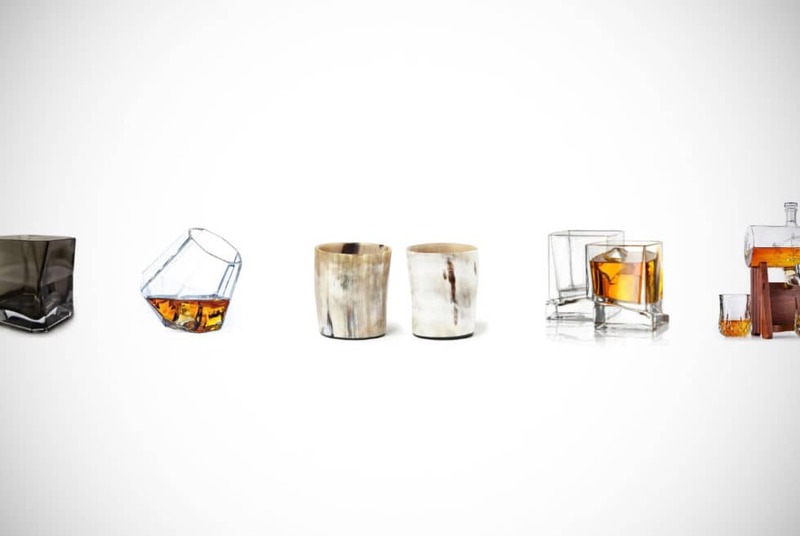 Designed to feel masculine in your hand, without being too much for your lady friend, these are something all whiskey aficionados should consider for their home bar. That was a lot of fun, wasn’t it? Is anyone else thirsty? If you are, you now have all the information you need to choose the right whiskey glass to quench that thirst. It doesn’t matter if you’re looking to add to your existing collection of whiskey glasses. It doesn’t even matter if you’re just starting out on your whiskey exploration journey. We’ve given you plenty of variety to choose from. We know how intimidating it can be to search through thousands of different whiskey glasses for men. Many do sound the exact same, trust us, we’re right there with you. We hope, however, that we sorted the wheat from the chaff. Hence, making it easier to make an informed decision. We tried our best to appeal to the wide spectrum of whiskey drinkers. From the tasters who like to swirl, nose, and just taste to the cocktail lovers and those hard-bitten cops that reside in all of us. Don’t let the fact you are not bothered about nosing your nectar before gulping it down deter you from one of the beauties above. Whiskey drinking, we feel, is a very personal experience. Maybe there‘s supposedly right ways and wrong ways, tasting tips, and a plethora of courses you can go on. Even tutorials are out there. However, none of that really matters, does it? Just like the argument of whether you have it on the rocks or neat. It’s down to personal taste. Enjoy a drink or two together with a friend or partner at the end of the day. Heck, get the most out of that 20-year old Taliskan. Regardless, we’re sure that you’ll find the right whiskey glasses for men to use for that here at Men’s Gear. One of the big highlights of a party is when a DJ is mixing and playing the music that everyone loves. However for all of this to go down well, the DJ in question has to be equipped with the right gear. 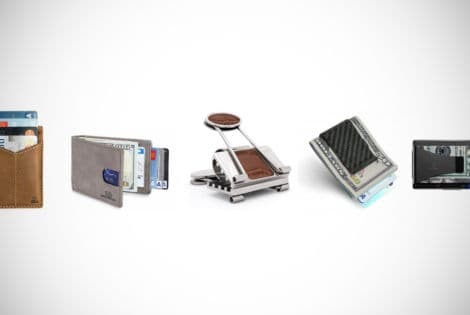 Check out these top 21 front pocket wallets and carry your cash and cards in style wherever you go.